Home › Hands-on › Space shuttle tiles, tank armour – it’s the Bullet BANG! Space shuttle tiles, tank armour – it’s the Bullet BANG! 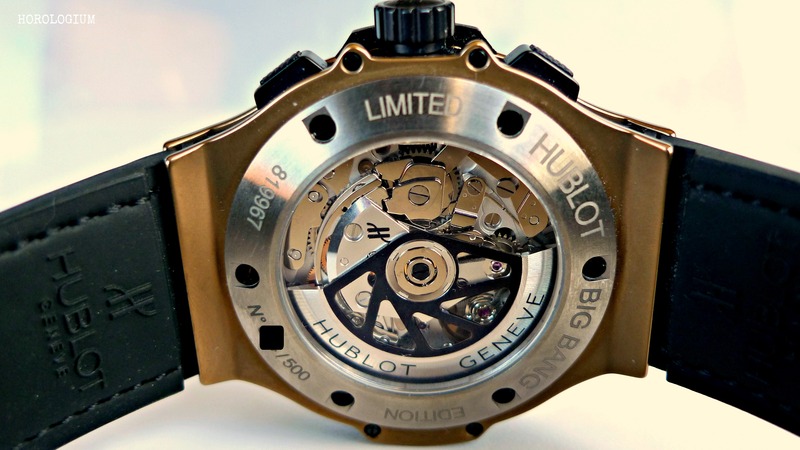 So, is Hublot’s Big Bang Bullet Bang (hereafter called ‘Bullet Bang’ for ease) bulletproof? 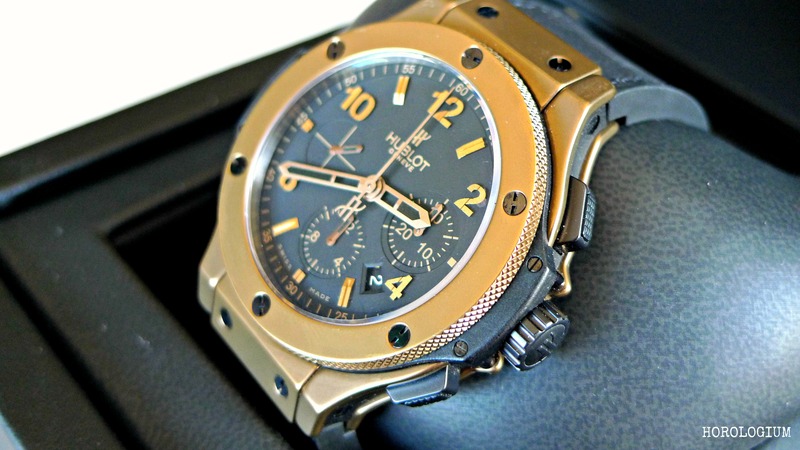 The case and bezel are made of micro-blasted Cermet, an alloy made from CERamic and METal (bronze in this case). Cermet is used for tank armour, space shuttle tiles and bullet proof vests. It is also used in the manufacture of more commonplace items such as saws, tools, resistors, capacitors and other electronic components which may experience high temperatures. The Bullet Bang’s case is supposedly unscratchable. Whether or not it is bullet proof is a test that I shall defer to others; please do tell me if you conduct such a test, and remember, photos or it didn’t happen. 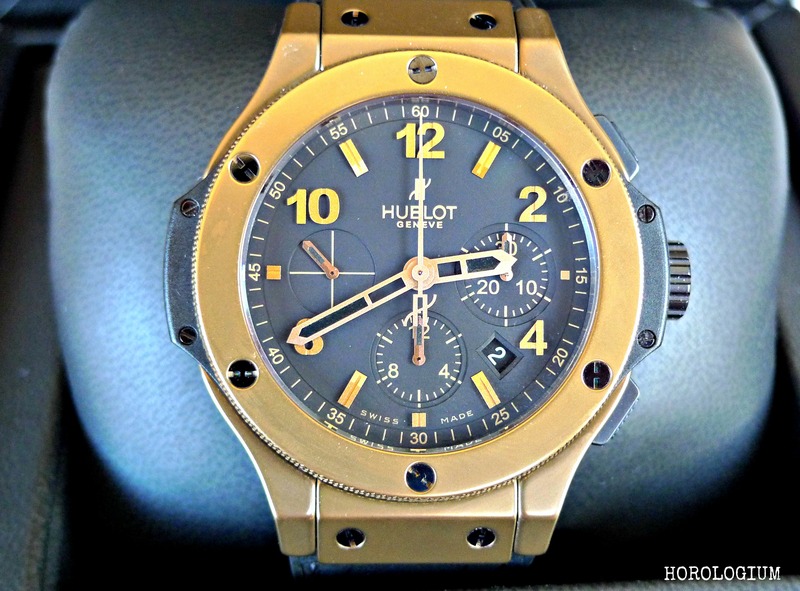 In many ways, Big Bangs seem to be watches that generate a lot of discussion, and they can be divisive. There are numerous reasons for this, including the sheer enormity of the range (both limited and regular production), and the unabashed in-your-face design of many of them. However, there is no doubt that they are much talked about and that Big Bangs have many fans. Today’s Bullet Bang, name aside, is one of the more discreet of the BBs. As is the case with its Big Bang siblings, the Bullet Bang is a 44mm case with titanium H-shaped screws and an anti-reflective sapphire. 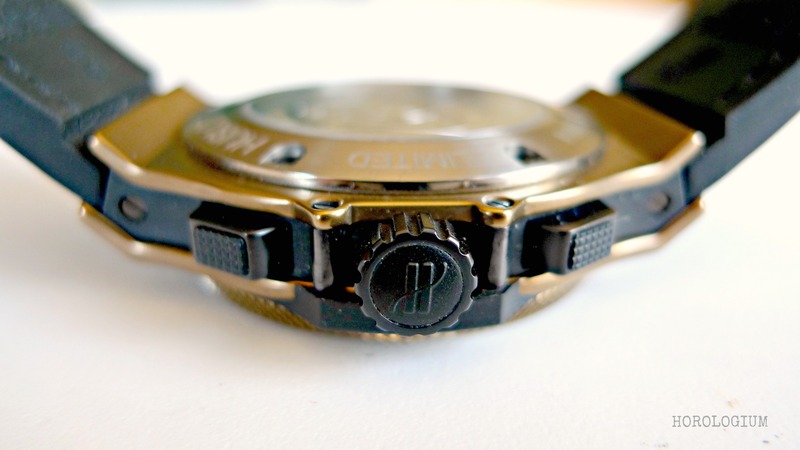 Its crown is black PVD steel with a black rubber insert and the watch is water resistant to 100m. The Bullet Bang is a limited edition of 500. What is interesting is that an unknown number of the early editions (possibly fifty) used a column wheel chronograph (called the HUB 44 RAC), and were identifiable as such on the dial. The rest of them, including this one, are the workmanlike Valjoux 7750 which makes then naturally less expensive than the early ones. The column wheels have a Lajoux-Perret calibre and are Ref. 303.BI.1190.RX whilst the 7750 are Ref. 301.BI.1190.RX. Given that it is a 7750 movement, I’m not entirely sure about the necessity of an open caseback, but here it is. The pushers are made of stainless steel with black PVD and require a firm hand to activate. Next to the pushers, the side inserts are made of black composite resin. The crown is also stainless steel PVD. The dial has good legibility, and the matte black case contrasts nicely with the polished hands, applied numbers and indices, which are bronzed to match the case. In terms of its sturdiness and scratch resistance, the use of Cermet and PVD makes the Bullet Bang an option as a solid toolwatch if you are looking for a toolwatch at this price point. You don’t have to worry too much about damaging it. This is on a rubber gummy Alligator, which suits it well and is comfortable. 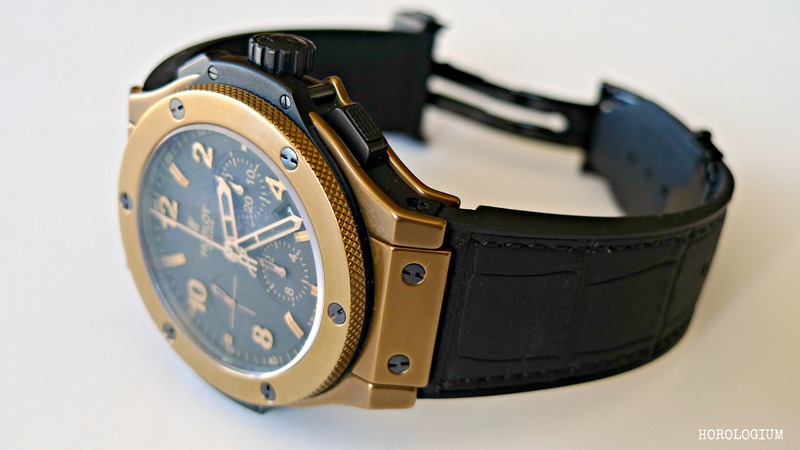 The deployant is PVD coated and easy to use, though its length means that for smaller wrists, it will cover the entire bottom of the wrist, so it may be more comfortable if it is pushed up a little from the wrist. The Bullet Bang is surprisingly lightweight and easy to wear. 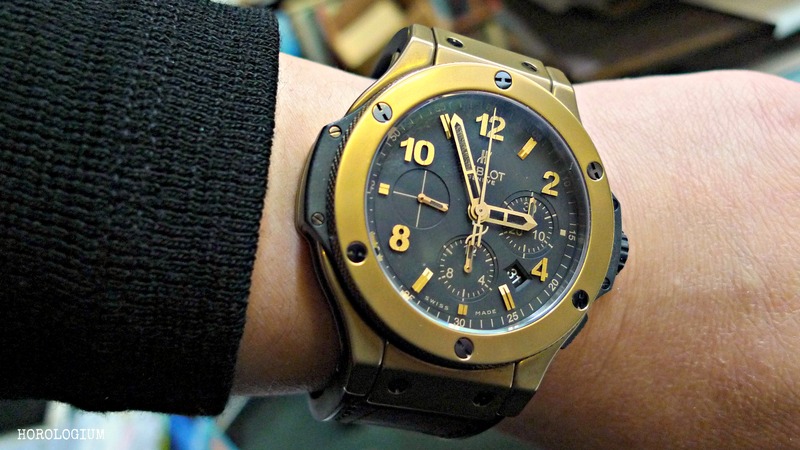 As far as Big Bang goes, this is a relatively low key one, and despite coming out a few years ago it fits in well with the 2011-2012 bronze trend, though as it is Cermet, it will not develop the patina that many bronze enthusiasts are keen about. If you like the look of it, it’s still available, including here in Australia. So that would make the 1st 50 more collectable than? But the 1st 50 are still part of the 500? how does that work?